The Raging Behemoth Pays it Forward and a Hero for Hire Thwarts a Demonic Incursion. We all remember a time when there were only enough comics in our collection to fill a shoebox, much less a long box. Well, when my collection of single issues could still be counted on the fingers of one hand, I fell in love with the entire medium. Perhaps it’s cliche to claim that it was a single comic book which opened up a whole world of storytelling and fantasy to me, but I swear that it’s true. Some people can name such influential titles as Frank Miller’s The Dark Knight Returns or Daredevil as their source of burgeoning fandom, but my father elected to bring home less sophisticated fare for his nine year-old boy. Today, we look back at Marvel Team-Up as a generic title from days gone by; it featured simplistic stories and threw together stories without adding anything significant to the landscape we now call the Marvel Universe. However, a title with nothing to prove and no ties to events or complex story lines can be appealing to a creative team. They have the freedom to tell stories which express their own ideas, hopes and dreams without management getting in the way. That’s exactly what takes place in Marvel Team-Up #126, which features two stories that not only showcased incredible super-people doing incredible super-things, but also showed how they could be incredible people with character. The first story, “A Firm Offer”, begins in the dark alleyways near Times Square, just before dawn. Daimon Hellstrom wanders along the sidewalk, stopping at the sound of someone in mortal agony down an alleyway. Spotting a figure standing over a body, he stealthily sneaks down toward his prey and is knocked down with a staggering punch from none other than Luke Cage, POWER MAN! In response, he transforms from his civilian identity into the mystical form of the SON OF SATAN, blasting Cage with hellfire from his amazing trident! Once these two former Defenders realize who each other is facing, it becomes clear that the slain victim is an old friend of Luke’s. The man, Tyrone, was often homeless, down on his luck, but always kind to Luke and found kindness in return, along with a meal and a few bucks from the sometime Hero for Hire. After the body dissolves in a sulfurous pile of smoking ash, he easily persuades Hellstrom to join him in investigating Tyrone’s murder. They bust heads all over town, gathering information from hoods and punks, many of which are terrified of an occult force taking root in NYC. Tracking down the source of this otherworldly influence, which turns out to be the Sons of Satannish! Their ritual in an abandoned warehouse is moments away from bringing the dreaded Satannish into our world thanks to a rare cosmic alignment, and our heroes find themselves caught in a trap of unholy mystic wreaths. It turns out that the cult WANTED to be found be Daimon and Luke, so Satannish would have a powerful body to inhabit once he breaches the dimensional barrier. Just when it can’t get any worse, the leader of the cult reveals himself to be Luke’s thought-dead friend, Tyrone! While he was always grateful to Luke for his kindness, he found life’s struggles too overwhelming, often feeling forgotten and hopeless, and finally took “evil” up on its “firm offer”. What follows is a daring escape by the two super-heroes and a fevered battle to fight past the cultists, trying with all their might to disrupt the arrival of Satannish until the stellar alignment has passed. All their efforts keep the demon from entering our realm, but not before he grabs Luke’s friend Tyrone to drag back with him. Power Man leaps onto Satannish’s gargantuan hand, pounding with all his might to force the fiend to release Tyrone from its grip. Satannish is unharmed, but also amused, and so decides to release the doomed man. Hellstrom catches Tyrone’s falling body while Luke crashes to the ground, unharmed. In his final moments of life, however, Tyrone reconciles with Luke and finally sees the light, deciding that , in the end, good has “the better deal after all”. The second story, “The Obligation” is a reprint from a newspaper insert which had been distributed to a select number of cities. The Incredible Hulk is in the middle of New York City, hounded by police when he could no longer keep himself hidden amongst the city’s millions. The cops are no match for the Hulk’s legendary strength as he destroys one of their cars by viciously hurling a lamp post into it. A single man runs against the flow of fleeing pedestrians, ducking into an alleyway and stripping off his clothes to reveal a familiar red-and-blue costume; it’s the Amazing Spider-Man! The web-slinger flies into action, landing atop a large chunk of pavement Hulk holds above his head, ready to pulverize the police in front of him. As per his custom, Spidey shoots webbing on the green goliath’s face, infuriating the monster but also turning his attention away from the officers. In a stunning feat of strength, Spider-Man catches a taxi cab rather than dodging it, protecting the police in its path after the Hulk throws it with his incalculable power. Spidey lures the jade giant toward a deserted warehouse district, then disappears so Hulk can calm down in a quiet area. A quick change of clothes back to Peter Parker and he approaches the exhausted form of Dr. Bruce Banner, clueless as to what his alter-ego has been up to for the last hour. Surprising the mild-mannered scientist, Peter immediately tries to comfort the shirtless man, offering his jacket and the last five dollars to his name. Banner, confused, wonders why Peter is being so nice, but learns that it’s simply a tradition Peter joined long ago, when a stranger gave him his last five bucks. Peter feels that it’s time to pass it along and helps Dr. Banner to high-tail it to safety. Months later, Bruce Banner finds himself in Chicago when, suddenly, an old man comes stumbling out of an alley who has just been robbed of his pension money. Banner bolts in search of a police officer for assistance, but finds himself running straight into the street thugs who robbed the old man. The toughs begin pummeling Banner for sticking his nose into their business, and we all know what happens when you get him upset! After unceremoniously dispersing the thieves, Hulk strolls down the street wreaking minor destruction along the way. An old man crouches on his knees on the sidewalk, the same man who Banner encountered who had been robbed. “You! Why do you not fear Hulk? Why do you not run? Hulk will smash stupid man!”, says the raging monster, but the man doesn’t care. He’s too tired to run, too despondent to resist, and he tells the Hulk to just smash him and end his misery. 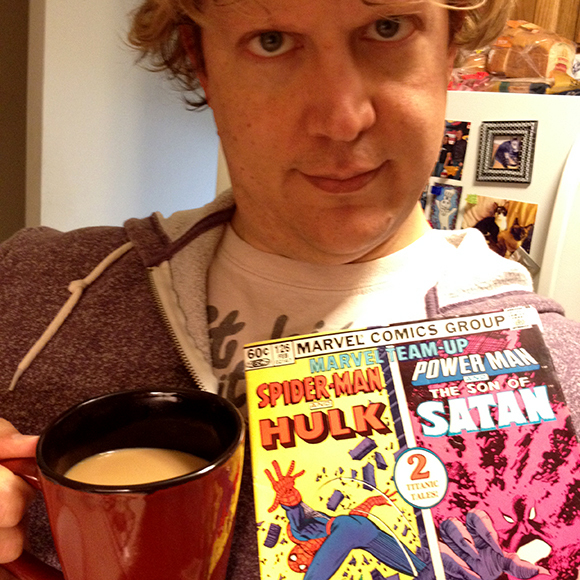 Hulk looks down upon the man in confusion, and something stirs within his cloudy brain. Without much that you and I would call thought, he reaches into his torn purple trousers and grabs five dollars within his pocket. Hulk places the crumpled paper into the man’s hand, saying “Here, take this. Hulk gives it to you”, and then walking off into the darkness. Bob Hall and Mike Esposito do an exceptional job of making this short story visually dynamic and highly engaging, and the art by Takenaka – perhaps in his only American comic work – brings gorgeous cartoonish renderings to life. What is so great about these stories are their humanity. Even though we are faced with monsters, demons and human despair, the message we take from the adventures of Spider-Man, Hulk, Power Man and the Son of Satan is one of hope, kindness and generosity. Despite all their powers and the hardships they face, our heroes win the day through the strength of their character. Over the years, I lost my original copy of this comic book, true believers. It was only last week that I came across it again at a second-hand bookstore, and my heart just exploded with joy. Sure, it might not contain the greatest tales in comics and you could easily call it simplistic. But I argue that the stories are well-written, the art is beautiful and the themes are timeless. After all these years, I still enjoy re-reading this over and over again, and I hope you all can do the same. Fare Thee Well! 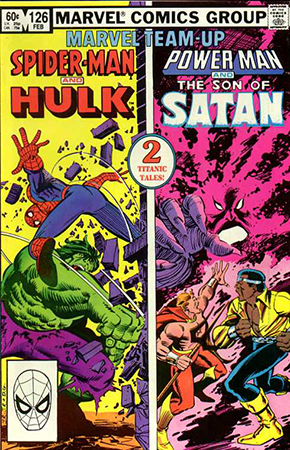 Marvel Team-Up #126 is written by J.M. DeMatteis and Jim Shooter, rendered by Bob Hall, Mike Esposito and Tomoyuki Takenaka, colored by Bob Sharen and lettered by Jim Novak and Diana Albers, with a cover by John Romita Jr.